One of the most common signs of the body aging biologically at a faster rate is that of osteoarthritis. The link between biological age and osteoarthritis is important to understand because of how osteoarthritis can cause the body to become less capable of working properly without pains. Osteoarthritis is a type of arthritis where the joints in the body become damaged and worn out. When this occurs pains in the joints will occur and they can degenerate over time. Inflammation can also occur in some of these areas. This is one of the most difficult physical conditions that a person can live with and it can be caused by a rise in one’s biological age. Biological Age and osteoarthritis - the link. A reason as to why osteoarthritis is closely linked to one’s biological age is because of how osteoarthritis can be caused by changes in the DNA of a person. Biological aging commonly occurs as a result of how telomeres in one’s DNA shortens over time. A telomere occurs at the end of a strand of DNA. When a cell replicates the telomere will become shorter. The telomeres are that are measured are ones that will be found in one’s white blood cells. It has been found in studies that the telomeres in the DNA of people who have osteoarthritis are ones that are shorter than what is found in those without the condition. This does not take into consideration some of the most common types of risk factors that can cause osteoarthritis over time like smoking or being overweight. In fact the real age of the people who have osteoarthritis can vary. While most people with this condition are over the age of fifty it can occur faster in people who do not take care of themselves properly and allow for their biological ages to increase at faster rates. This means that a person who is fifty years old and is not very active could be just as likely as a seventy year old person to develop this condition. Biological age monitors. It is recommended by professionals the use of tools monitoring biological age. 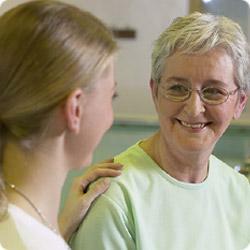 One of the most accurate and easy-to-use is Biological Age test from Health Reviser. Week interval in body's age assessments is usually enough to detect sudden jumps in aging, which might be a sign of a health issue. Because of the link between biological age and osteoarthritis it has been found that the condition can be prevented if a person takes care of one’s health with that person’s biological age in mind. Reducing the free radicals that appear in one’s body that can damage it helps. Avoiding alcohol and tobacco helps and avoiding prolonged sunlight exposure can also help. Another tip to use is to look into being more active. It is known that osteoarthritis and a rise in one’s biological age can occur in a body that is not active. It helps to look into having a good exercise regimen so that it will be easier to keep from developing osteoarthritis in the future. It helps to look into the relationship that is found between one’s biological age and osteoarthritis. When a person’s biological age is greater the DNA strands that a person has can shorten and osteoarthritis can develop. This condition can be prevented when the right tips for improving one’s biological age are used. Don't forget using Biological Age Test to monitor your success in anti-ageing.